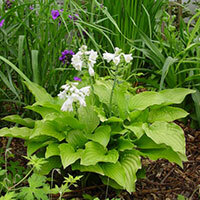 Hostas are among the most widely grow perennials and with good reason. Mature plants vary from tiny 4-inch dwarfs to giants that span a full 210 cm, making them well suited to dozens of garden applications. 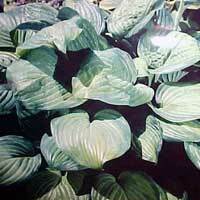 Hosta foliage varies from simple narrow leaves to ones that are broad, rippled and heart shaped. Leaf colors encompass the full range of gold to green to blue, with a variety of contrasting edgings and patterns. The choices go on and on. Hosta plants are the busy gardener’s dream. Simply find a variety that is well match to the conditions of your landscape site, then look forward to years of carefree, attractive foliage accented with spires of lavender or white flowers. 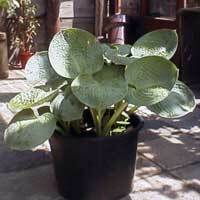 ‘Abiqua Drinking Gourd’ is a medium to large hosta that forms clumps. Its leaves are very round, thick and corrugated like cardboard. They are blue-green in color and deeply cupped. White flowers are tubular and appear on tall stems held above the foliage in late summer. ‘American Halo’ is grown mainly for its handsome leaves. Heart-shaped and large, they have wavy edges, a corrugated surface, and two colors, blue-green overall and creamy-white along the edges in broad, irregular bands. The flowers are pure white and funnel-shaped, appearing on tall stems above the leaves from late spring to midsummer. Creamy white center edged and interspersed with light and medium green. The leaf center begins yellow and changes to white later in the season. Lightly cupped, lightly folded, moderately corrugated, and broadly ovate. Solid blue sheet with yellow, cream white edge, good sport of ‘ later Hadspen Blue ‘. 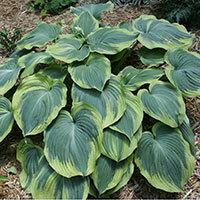 The yellow-leaved ‘August Moon’ and other hostas with yellow leaves, tend to need more light for brilliant leaf color. 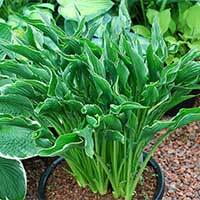 Hosta are clump-forming herbaceous ornamentals grown mostly for their attractive foliage. The green-gold or chartreuse leaves of ‘August Moon’ are heart-shaped, have a pleated and crinkled texture and wavy edges. The lavender flowers are funnel or bell-shaped and appear on tall, sturdy stems in the summer. 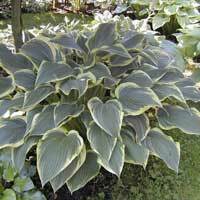 Band of Gold' hosta has leaves with a maple-leaf shaped dark green center and a wide margin that emerges gold and fades to creamy white. White flowers appear in early summer. This large selection has thick, corrugated, blue-green leaves with broad, creamy margins that lighten to white as it matures. Near white flowers appear in midsummer and may attract hummingbirds. Barbara and Ann, hence its name. Good slug resistance. Suitable for planting in mixed containers and tubs. 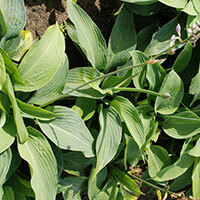 Hosta go completely dormant in the fall, and the dying foliage can be removed any time before mid-spring. Easily divided in either spring or fall, but plants may be left alone for years. Spot: half shade/shade. Growth medium. This is one beautiful, big, blue hosta! Big daddy plantain lily is a clump forming, shade tolerant, herbaceous perennial that is primarily grown for its ornamental foliage. In spring, it produces a large clump of rounded, corregated, waxy leaves of blue-green, and in early summer upright, sturdy stems of white trumpet-shaped flowers appear. 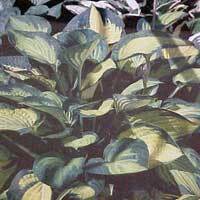 This hosta prefers part sun to part shade and fertile, well drained soil. Blue angel plantain lily is a clump forming, shade tolerant, herbaceous perennial that is primarily grown for its ornamental foliage. In spring, it produces a large clump of heart-shaped, wavy, waxy leaves of slate blue, and in midsummer upright, sturdy stems of trumpet-shaped flowers of white appear. 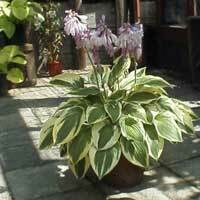 This hosta prefers part sun to part shade and fertile, well drained soil. It is widely used in mixed perennial borders and massed as a large groundcover for shade. 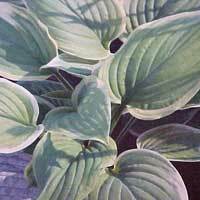 Most hosta are highly susceptible to slug damage. Chalky blue leaves, yellow changing to a creamy margin, 'Fragrant Blue' sport that looks a lot like 'Secret Love'. Spot: half shade/shade. Growth medium. Plants form sturdy mounds of foliage, topped with lily-like blooms. 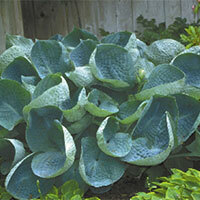 Blue mouse ears has thick, rounded blue-green leaves with a powdery finish. Soft lavender flowers appear in July. Good slug resistance. 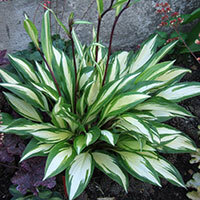 An outstanding Hosta for edging or the shady rock garden. Protect from hot afternoon sun. Clumps may be easily divided in the spring or fall. ‘Blue Wedgwood’ is a small to medium-sized hosta. It forms spreading clumps of remarkably uniform upright, grayish-blue-green leaves that are wedge-shaped, cupped, substantial and puckered. Pale lavender to white, bell-shaped flowers appear on leafless stems held above the foliage in late summer. Blue cadet plantain lily is a clump forming, shade tolerant, herbaceous perennial that is primarily grown for its ornamental foliage. In spring, it produces a medium clump of heart-shaped, waxy, cupped and puckered leaves of blue-green, and in late summer upright, sturdy stems of trumpet-shaped, white flowers appear. 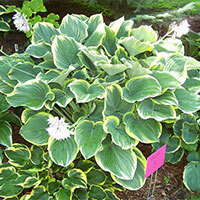 This hosta prefers part sun to part shade and fertile, well drained soil. Brim cup plantain lily is a clump forming, shade tolerant, herbaceous perennial that is primarily grown for its ornamental foliage. In spring, it produces a compact clump of heart-shaped, waxy, cupped and puckered leaves of sea green with variegated margins of cream. In early summer, upright, sturdy stems of trumpet-shaped, lavender flowers appear. 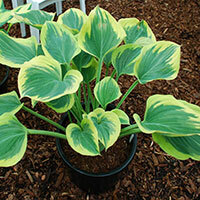 This hosta prefers part sun to part shade and fertile, well drained soil. Cherry Berry hosta is a vividly breathtaking plant. Its beautiful lance shaped leaves are white with dark green margins. Occasionally the dark pigmentation pierces a thick streak into the white center of the leaf. The clump is rather modest in size. In mid summer, short red spikes are covered in deep lavender or purple flowers. This one, the pretty variegated ‘Climax,’ forms a large, vase-shaped, upright mound. The leaves are oval, with pointed tips, and green with wide, irregularly shaped yellow margins. Pale, lavender tubular to bell-shaped flowers appear on leafless stems held above the foliage in late spring to early summer. Diana Remembered Hosta is named after the late Diana Princess of Wales. 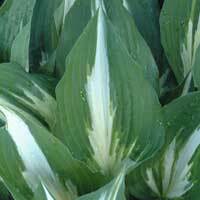 These medium sized hostas have attractive blue-green leaves with slightly streaked creamy white margins. Extremely fragrant white flowers mid summer. ‘Dream Queen’ is a medium-sized hosta that forms neat spreading clumps. Its large, round to heart-shaped leaves are ribbed. They are blue-green accented with a streaky, narrow center of creamy white. Pale lavender funnel to bell-shaped flowers appear on tall stems held above the foliage in mid to late summer. Earth Angel is like other hotsa’s among the most popular of perennials for shady areas, with hundreds of varieties now readily available. Plants form sturdy mounds of foliage, topped with lily-like blooms. This spectacular large specimen selection has thick blue-green leaves with a wide and streaky margin of light yellow to creamy white. Lavender flowers appear in June. Clumps may be easily divided in the spring or fall. The ‘Fantabulous’ is a mound of dark green heart shaped, twisted leaves that are highlighted with a wide creamy white border. The lavender flowers appear in mid Summer atop taller spikes. Its best for shade. Fire and ice plantain lily is a clump forming, shade tolerant, herbaceous perennial that is primarily grown for its ornamental foliage. In spring, it produces a small clump of heart-shaped, wavy, twisted leaves of dark green with shocking white variegated centers. In midsummer, upright, sturdy stems of trumpet-shaped, lavender flowers appear. 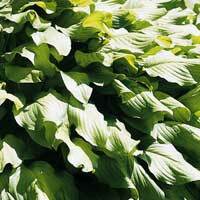 This hosta prefers part sun to part shade and fertile, well drained soil. It is widely used in mixed perennial borders and massed as a large groundcover for shade. This midsized specimen selection has thick, powdery blue-green leaves with creamy-yellow margins that later fade to white. Pale lavender flowers appear in August. Thick substance, so good slug resistance. Suitable for planting in mixed containers or tubs. 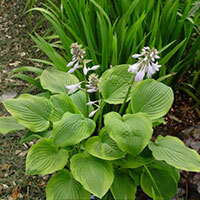 Hosta go completely dormant in the fall, and the dying foliage can be removed any time before mid spring. Easily divided in either spring or fall. A sport of ‘Halcyon’, this is one of the best selections for late-season interest in the garden. 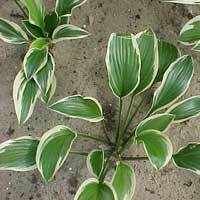 It is a not a big hosta it has strongly light frosted blue leaves, whose strongly wavy margins. That gives a graceful sight where we sometimes get to see the white back of the sheet. Large round yellow leaves, the all-gold sport of 'George Smith'. Its a plantain lily is a clump forming, shade tolerant, herbaceous perennial that is primarily grown for its ornamental foliage. In spring, it produces a compact clump of heart-shaped, variegated leaves of pale green with wavy, creamy yellow margins. In late summer, upright, sturdy stems of trumpet-shaped, lavender-pink flowers appear. 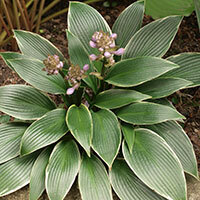 This hosta prefers part sun to part shade and fertile, well drained soil. This midsized selection has dark-green leaves with a margin that begins creamy-yellow, ageing to white. Very fragrant near-white flowers appear in July. A nice fragrant specimen, also good for massing. Clumps may be easily divided in the spring or fall. A sport of ‘Fragrant Bouquet’. 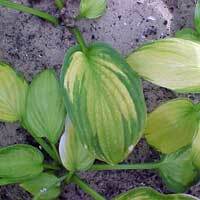 Intensely blue-green pebbled leaves with a slightly rippled, cream to golden yellow margin with overlapping variegation. Lightly wavy, moderately corrugated with curved and twisted leaf tips. Green changing to yellow leaves with a white margin, a sport of 'Fried Bananas'. Spot half shade/shade. Growth fast to medium. Large round golden leaves, blue-green margin, sieboldiana 'Elegans' sport, better than 'Borwick Beauty'. Spot: half shade/shade. Growth medium to slow. The flower color is violet flowering time is from about July to August. The leaves are green + yellow and about 30 cm. high. The adult height of this plant is about 60 cm. This plant is suitable for gardens with several (almost) mature trees and shrubs. Requires a site with full shade from trees or shrubs and a soil rich in humus. This plant can also be used as a border plant (in a slightly sunnier spot). The soil should be moist or well. It is a striking plant. Guacamole plantain lily is a clump forming, shade tolerant, herbaceous perennial that is primarily grown for its ornamental foliage. In spring, it produces a large clump of enormous, chartreuse to gold leaves with wide darker green margins. In late summer, upright, sturdy stems of white trumpet-shaped flowers appear. 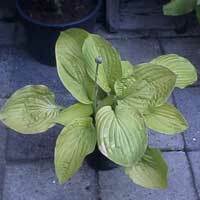 This hosta prefers part sun to part shade and fertile, well drained soil. Large blue-green rounded leaves with a yellow margin that turns cream, 'Christmas Tree' x 'Halcyon' hybrid with white flowers. Spot: half shade/shade. Growth medium. Spot: half shade/shade. Growth medium to slow. The flower color is soft lilac and the flowering period is from about July to August. The leaves are green and about 40 cm. high. The adult height of this plant is about 70 cm. This plant is suitable for gardens with several (almost) mature trees and shrubs. Requires a site with full shade from trees or shrubs and a soil rich in humus. This plant can also be used as a border plant (in a slightly sunnier spot). The soil should be moist or well. It is a striking plant. Thick heart-shaped grey-green leaves with a wide yellow changing to cream margin, 'Sagae' sport but smaller. Spot: half shade/shade. Growth medium to slow. Somewhat pointed, shiny dark green leaves of good substance with a wide yellow margin that turns cream. Spot: half shade/shade. Growth medium. Dark green leaves with a creamy-yellow margin that turns white, a vigorous growing new cultivar. Spot: half shade/shade. Growth fast to medium. Green leaves with a slightly wavy margin, tetraploid plant with very large flowers. Spot: sun/shade. Growth fast to medium. ‘Mayan Moon,’ has blue-green leaves with wide gold margins. The leaves are egg-shaped and have a corrugated texture. Grown mostly for its striking leaves, it is an herbaceous perennial for shade with a mounding habit. The flowers are white and tubular, and appear on tall, sturdy stems in late summer. Large and bright, ‘Midwest Magic’ needs a bit of sun to develop is warmest leaf color. 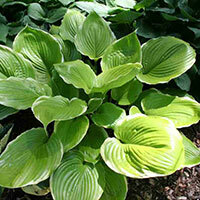 Hostas are herbaceous perennials prized for their mounding habit, toughness, and attractive leaves. The leaves are heart-shaped leaves and yellow-gold with wide dark-green margins. They are also slightly glossy and lightly corrugated. The flowers are pale lavender, fertile, and tubular and appear on leafless stems held above the foliage in mid to late summer. The plants form neat mounds. mid-summer; an interesting eye catching variety. This hosta is a clump forming, shade tolerant, herbaceous perennial that is primarily grown for its ornamental foliage. In late spring, it produces a neat clump of wavy, heart-shaped leaves of dark green with clean white stripes down their centers. In early summer, upright, sturdy stems of bell-shaped, lavender flowers appear. 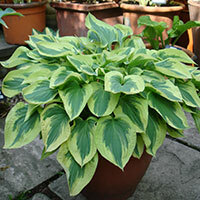 This hosta prefers part sun to part shade and fertile, well drained soil. It is widely used in mixed perennial borders or planted in masses as a groundcover for shade. This specimen selection has a blue-green centre, with wide golden margins. White flowers appear in June. Similar to ‘Frances Williams’, but much less prone to leaf scorch. 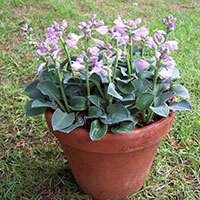 Suitable also for planting in mixed containers or tubs. 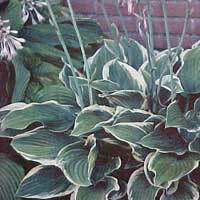 Hosta go completely dormant in the fall, and the dying foliage can be removed any time before mid spring. Easily divided in either spring or fall, but plants may be left alone for years. Groot hartvormig tot rond blauw berijpt blad met een brede gele rand, mooie sport van 'Great Expectations'. Spot: half shade/shade. Growth medium. Paul’s Glory is plant appropriate for a partially shade or partially sunny garden bed, including ones in the warmer southern region of the United States. This is a rare cultivar, being a sport from ‘Perry’s True Blue’. Emerging leaves are golden and fade into a paler gold surrounded with a band of blue. Pale lavender flower spikes held high above the leaves appear in late spring. Pilgrim, is a clump forming, shade tolerant, herbaceous perennial that is primarily grown for its ornamental variegated foliage. In late spring, it produces a neat clump of heart-shaped, sea green leaves with a wide creamy white margin. In early to midsummer upright stems of trumpet-shaped flowers of lavender appear. This hosta prefers part sun to part shade and fertile, well drained soil. It is widely used in mixed perennial borders or planted in masses as a groundcover for shade. This strange and bizarre smaller selection has green leaves with white edges, each rolled or folded into a ruffled tube shape. Pale lavender flowers appear in August. Suitable also for planting in mixed containers or tubs. 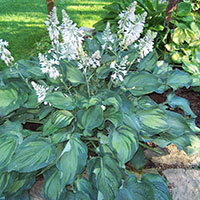 Hosta go completely dormant in the fall, and the dying foliage can be removed any time before mid spring. Easily divided in either spring or fall, but plants may be left alone for years. Slugs may need to be controlled. 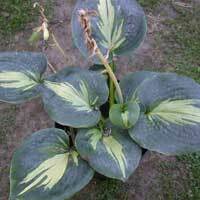 Queen Josephine hosta, or plantain lily, is a clump forming, shade tolerant, herbaceous perennial that is primarily grown for its ornamental variegated foliage. In late spring, it produces a neat clump of heart-shaped, dark green leaves with a thin gold margin. In mid to late summer upright stems of funnel-shaped flowers of light purple appear. 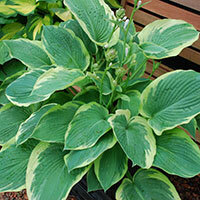 This hosta prefers part sun to part shade and fertile, well drained soil. It is widely used in mixed perennial borders or planted in masses as a groundcover for shade. This medium-sized selection has green leaves with distinctive red stems, a bit like Swiss Chard. Pale lavender flowers appear in July. Suitable also for planting in mixed containers or tubs. 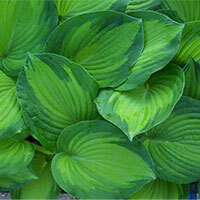 Hosta go completely dormant in the fall, and the dying foliage can be removed any time before mid spring. Easily divided in either spring or fall, but plants may be left alone for years. Slugs may need to be controlled. This one, the stunning ‘Revolution,’ forms medium-sized, neat, sturdy clumps of pointed, oval leaves that are very thick and ribbed, with creamy white centers flecked and streaked with dark-green, and margins widely streaked in two shades of green. Pale lavender, trumpet-shaped flowers appear on pale leafless stems held above the foliage in midsummer. The flower color is white and the flowering period is from about July to August. The leaves are light green and about 40 cm. high. The adult height of this plant is about 80 cm. This plant is suitable for gardens with several (almost) mature trees and shrubs. Requires a site with full shade from trees or shrubs and a soil rich in humus. This plant can also be used as a border plant (in a slightly sunnier spot). The soil should be moist or well. It is a striking plant. Sagae hosta, or plantain lily, is a clump forming, shade tolerant, herbaceous perennial that is primarily grown for its ornamental foliage. In late spring, it produces a large clump of broad, heart-shaped, waxy green leaves with a thin yellow margin. In midsummer upright stems topped with trumpet-shaped pale lavender flowers appear. 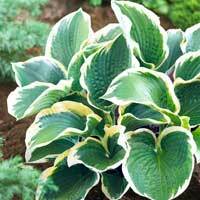 This hosta prefers part sun to part shade and fertile, well drained soil. It is widely used in mixed perennial borders or planted in masses as a groundcover for shade. The flower color is lavender and flowering time is from about July to August. The leaves are creamy yellow and green + about 35 cm. high. The adult height of this plant is about 70 cm. This plant is suitable for gardens with several (almost) mature trees and shrubs. Requires a site with full shade from trees or shrubs and a soil rich in humus. This plant can also be used as a border plant (in a slightly sunnier spot). The soil should be moist or well. It is a striking plant. 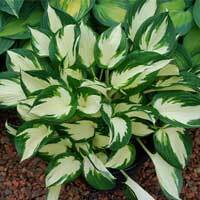 The pretty variegated ‘Snow Cap’ is a medium to large hosta that forms neat clumps. Its large, substantial, heart-shaped leaves are slightly puckered and cupped. 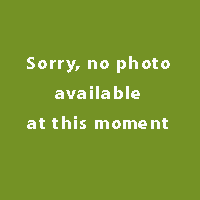 They are blue-green in color accented with wide, white, irregularly-shaped margins. White funnel-shaped flowers appear on tall stems held above the foliage in late summer. It’s a shade tolerant, herbaceous perennial that is primarily grown for its ornamental foliage. In late spring, it produces a small clump of wavy, lance-shaped green leaves edged with ivory. In midsummer upright stems topped with white trumpet-shaped flowers appear. 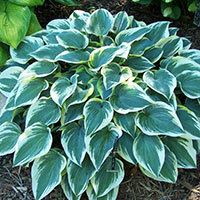 This hosta prefers part sun to part shade and fertile, well drained soil. It is widely used in mixed perennial borders or planted in masses as a groundcover for shade. 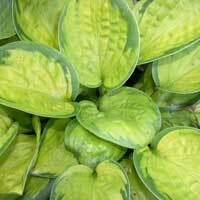 Hosta 'Spartacus' illuminates the garden with it's brightly contrasted heart-shaped leaves. The leaves of 'Spartacus' are deeply veined and are slightly reverse-cupped. This hosta is sure to be a favorite as more people view it at maturity. Nearly white flowers are borne on long scapes that arch towards the ground. This one, ‘Sum and Substance,' is widely prized for its size and its huge, heavy, leaves that are chartreuse-gold and have a waxy sheen. It’s a massive plant, with the leaves rising high and spreading wide on long, stout petioles (leaf stems), forming an impressive clump. The flowers are pale lavender, and borne on leafless stems above the leaves in mid-summer. 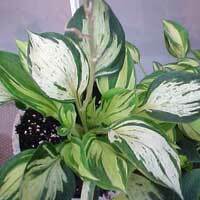 ‘Twilight,’ adds large size and elegant variegation. It makes a spreading mound of heart -shaped, pointed, deep-veined leaves that are dark green with wide irregular warm-yellow margins. The leaves have heavy substance and some resistance to slugs. The flowers are lavender, striped, and tubular, and are borne in clusters on stems that rise above the leaves in mid-summer. Rounded blue-green leaves with a yellow margin, a very good sport of 'Pearl Lake'. Hosta of the Year 2015! A beautiful, very shiny, vigorous, huge mound of margined foliage. The wide margin emerges chartreuse, changing to creamy white by early summer. H. 'Victory' has thick substance making it slug resistant. Near white flowers on tall scapes from mid-July into early August. This is a sport of H. nigrescens 'Elatior.' which is known for its beautiful, upright, vase-like form - and a favorite in our display garden. Victory is outstanding as a specimen or background plant. It is a shade tolerant, herbaceous perennial that is primarily grown for its ornamental foliage. In late spring, it produces a small clump of broad, lance-shaped leaves with white to pale green interiors edged in dark green. In mid to late summer upright stems topped with trumpet-shaped flowers of lavender appear. This hosta prefers part sun to part shade and fertile, well drained soil. It is widely used in mixed perennial borders or planted in masses as a groundcover for shade. The flower color is soft purple and the flowering period is from about July to August. The leaves are green + yellow and about 25 cm. high. The adult height of this plant is about 50 cm. This plant is suitable for gardens with several (almost) mature trees and shrubs. Requires a site with full shade from trees or shrubs and a soil rich in humus. This plant can also be used as a border plant (in a slightly sunnier spot). The soil should be moist or well. It is a striking plant. Vigorous white-edged sport of 'Sum & Substance' with great color contrast between the chartreuse leaves and white margin. 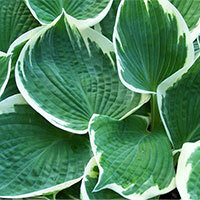 These Hosta forms a giant clump of unruly chartreuse foliage with white margins. Pale lavender flowers mid summer. Sport of a splashed seedling of unknown parentage. Colorful hosta with dark green leaves and a wide bright white margin. Attractive leaves are smooth and slightly wavy.Pale lilac flowers in summer. ‘Yellow River,’ has thick, wedge-shaped, elegantly pointed leaves that are dark green with distinctive, wavy, pale green to yellow margins. Held upright and horizontally on stout petioles (leaf stems), the leaves are as big as dinner plates and arrange themselves in a spreading mound. The flowers are white and borne in clusters on stalks that rise above the leaves in mid-summer.